When I was decorating our master bedroom, I had one huge blank wall behind the TV and I couldn't decide what to do there. Frames wouldn't work because I didn't want them to compete with the TV. I needed something huge, but subtle at the same time. I started looking at vinyl and I found Vinyl Impression. When I saw the giant world map in their shop I was completely sold. What a cool, awesome, unique idea for a big wall! You could use it to mark places you've traveled or places you want to go. 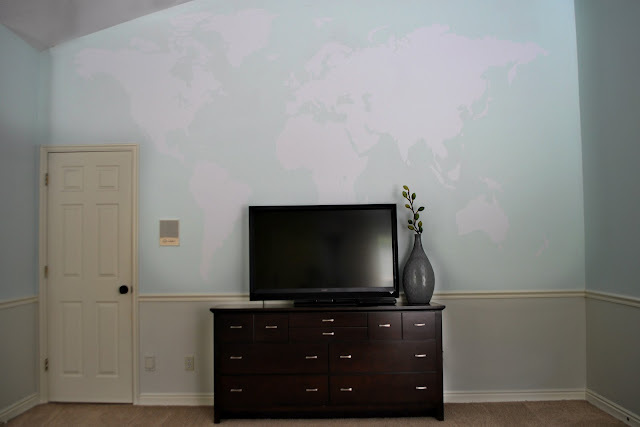 I loved the idea of being able to show the boys where certain countries are. And, since it's vinyl it can easily be removed when you want to change the decor. The map has different size options, if you don't have a huge wall. Here's mine on our wall. I love how it's subtle (though that made it really hard to photograph it) and how it works with the rest of the room which you can see HERE. We haven't put our pins up yet, because I'm still deciding how I want to use them. Putting up the map took some work, but it was worth it. The vinyl came in 4 large rolls, which were then cut in half, making eight pieces total. (Part of what made the application hard for us was that we were up on big ladders for the top part.) The pieces matched up well and I was really pleased with the product. In regards to applying the map, we had the most luck with holding the piece where we wanted it to go and then placing painter's tape along the wall with a level to mark where the piece should go. (The tape essentially underlined the sheet of vinyl.) Then we peeled off the backing (with the sheet on the ground) and with a person on each end carefully adhered the page. We peeled off the transfer paper slowly. Well, the world map isn't the only great vinyl at Vinyl Impression. Here are some more of my favorites. 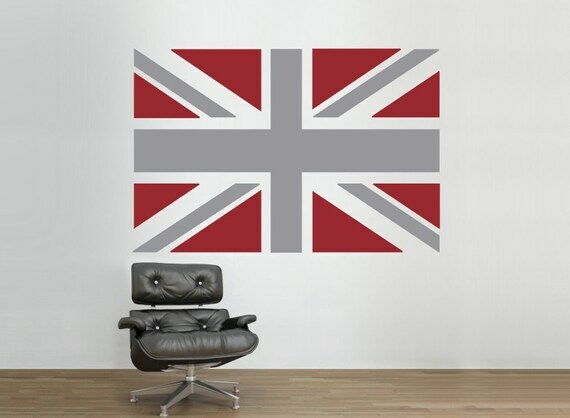 Wouldn't this be awesome in a boy's room? I love how you can pick the colors for the vinyl as well. So, if you have an open wall you're staring at in your home you might just want to hop over to Vinyl Impression (or find them on etsy HERE) and take a peek at the amazing selection. These are so cool:) Sadly I have a older home with textured walls, not sure that would work? Love the idea. how fun. I love the map, and the dimension it gives the wall. Ja ja , ojala necesitara un mapa para ver los lugares que he visitado.Hay un globo, donde vivo en Sudamérica .Un mapa de los sueños,lugares que iría a visitar.Me gusta la idea.Cariños. You're always finding such cool stuff. I love that my country is so easy to reach! I love it! It is totally amazing. Our map could be of all the places we have lived! Five moves in 4 years makes for quite the adventure! Very cool stuff...but does vinyl work on walls that are hand textured? I would say it depends on how textured they are. If it's subtle I think the vinyl would be fine. If it's heavy texture then I would say no. 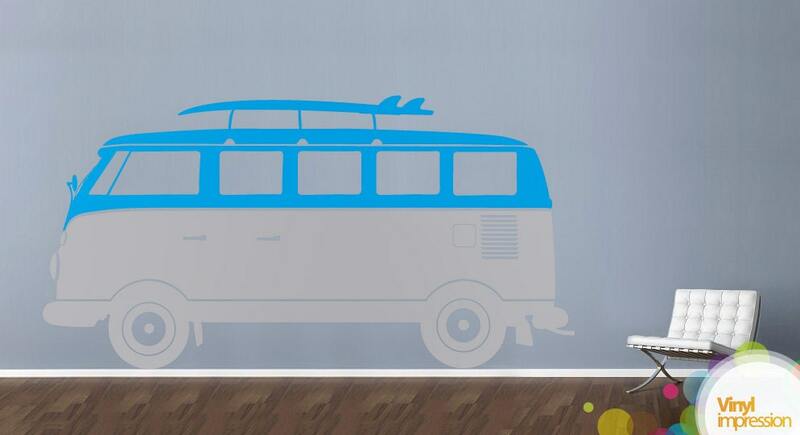 You could try with even a sticker to see how well it lays on your walls.